Holly, her 11-year-old friend who arrived in Singapore by way of Boston, gets it. She misses her family, too. Both girls are “Techsperts” at their school and big technology enthusiasts. So when the opportunity to enter the Young Technopreneur Challenge arose last year, the two put their heads together and began brainstorming solutions. Their app, Generation Connection, aims to bridge the gap between all older adults and youth, not just relatives. Users will select interest areas and available times, then the app will create intergenerational matches and schedules video chats. It will be simple to use and have parental controls to ensure it’s safe for kids. Ellison’s great-grandpa is excited about the idea and — along with 84 percent of the nearly 200 older adults the girls interviewed — says he’s willing to learn how to use a new technology to connect with young people in this way. Last year, as fourth graders, the girls won an award for the most creative use of technology. 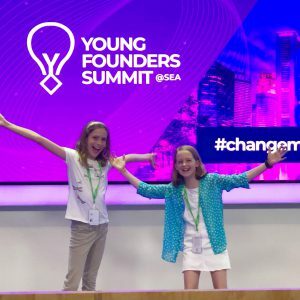 This year, they entered Generation Connection into another competition, the Young Founders Summit. Out of more than 100 applicants, they’re now semifinalists in the Founders Bootcamp, a high school accelerator program. They’ve written a business plan, created a video explainer, done extensive market research, developed a wireframe for the app, and grown a small team. While doing their research, the girls discovered Encore.org’s Gen2Gen campaign. 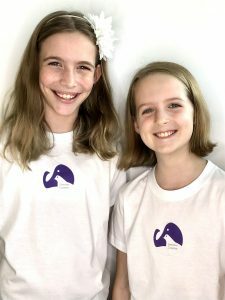 “We loved everything we saw from the videos to the projects being done, and the girls and I now watch everything happening with Gen2Gen through Facebook,” says Ellison’s mom, Heather. If all goes well, they’ll travel to Los Angeles in April to compete in the finals. And if they’re winners, they’ll spend two months this summer in a bootcamp getting their business off the ground. Ellison and Holly would both love to win the competition, but their primary motivation skews more altruistic. 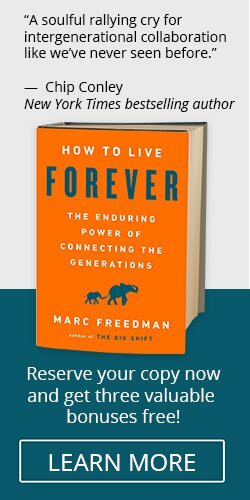 Learn more and support the founders of Generation Connection here.